As opposed to just wandering around a museum, a museum tour is all about sequential and consistent visit. The items and stories are all grouped according to a certain theme, and the route is guiding the visitor along. Such route could be executed as a floor plan with the items/stories marked on it. However, visitors often find it difficult and distracting to check the floor plan at every point of the tour. 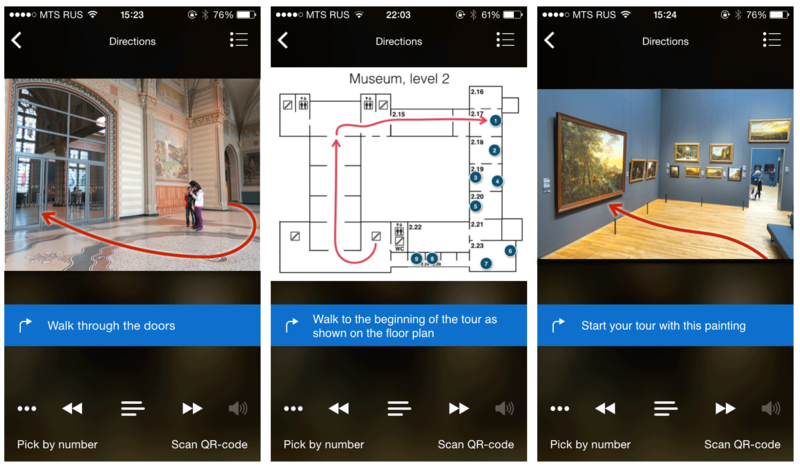 Much easier way to guide visitors through a museum is Photo Navigation. So… What exactly is Photo Navigation? 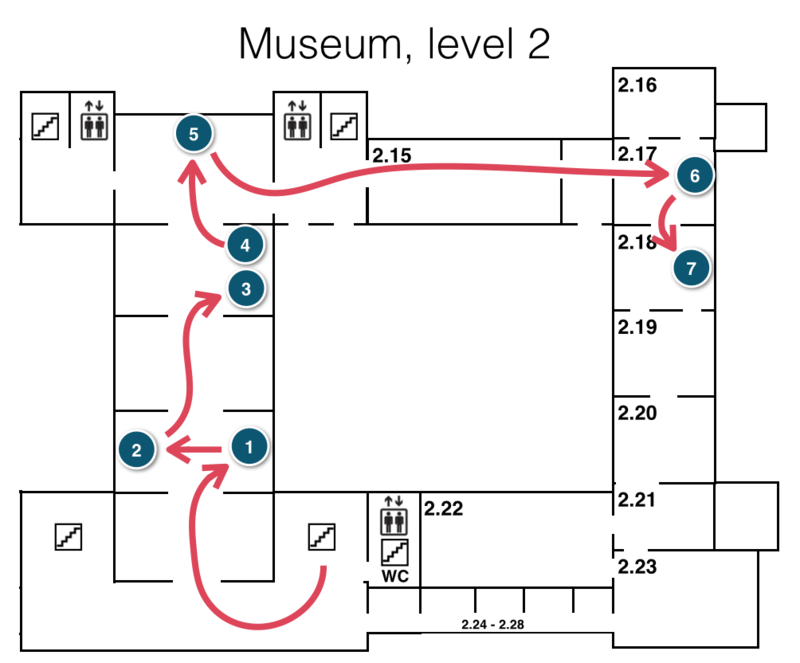 Photo Navigation is type of leads for the visitors shaped as photos of the museum’s interior with overlaid pointers (usually arrows.) Apart from the photos one could use text or audio format. Lets have a look at one of the instances. First two pictures are navigating users to one of the items, whereas the third one is showing the way to the next one. There are a few notions that one should keep in mind while applying the photo navigation. When taking shots of the museum’s interior, make sure that your shooting point is most beneficial. The easiest way, of course, is to take a picture from point of the item to the next one, so the photo would exactly what a person would see. However, in some cases such positioning is not possible. Then you have to take a picture from another angle, so both items would be seen. When drawing an arrow, pay attention to its positioning, for it should show exactly where from and where to. Therefore, marking its beginning with a circle would signify the standing point. Whereas no such circle would mean continuation of a walk. Often you need to draw the arrow to the exact item on the wall/elsewhere as opposed to the floor spot if in front of it. One of the options of drawing the arrows would be “putting” them on the floor. This way it would be easier for the visitors to associate their movement with the arrows. Naturally, it would be best to take the pictures once there is no one in the museum/site/space. This will allow you to pick the right angle and execute the photos in the best way. One should avoid having many navigational photos in a row. This will just confuse the visitors and get them lost. However, in a very very few instances this could not be avoided. For example in the beginning of the tour. In this case one could use a floor plan with one arrow to simply it. This will reduce the amount of photos and make the walk pleasurable. There is a multitude of various graphic or vector applications that allow arrow drawing, moreover you could use: PowerPoint, Keynote, Word, Pages, GoogleDocs etc. Choose the one that’s suits you most and go for it!